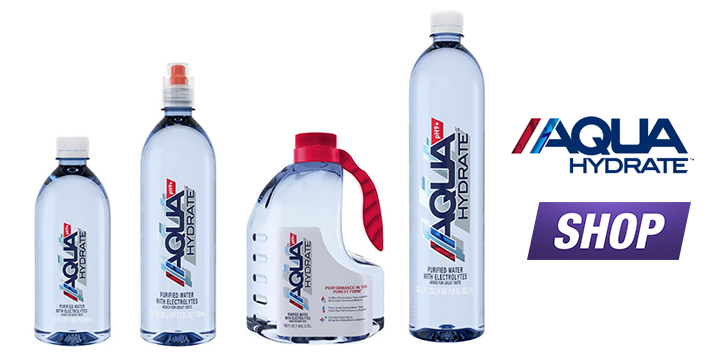 Through an advanced three-step proprietary process, AQUAhydrate® is ultra-purified, supplemented with all natural electrolytes and trace minerals and then elevated to an alkaline pH of over 9 using electrolysis. It is this powerful synergy between alkalinity, electrolytes and minerals, which fuels ultimate hydration, balance and performance. Proprietary process can be brought to any regionally sourced R/O reverse osmosis purified water. Water is filtered into our system where cutting-edge pharmaceutical grade UV filters clear impurities and strip water of unwanted dissolved solids. We add a proprietary blend of 72 trace minerals sourced naturally that provide significant electrolyte levels giving AQUAhydrate 2X the amount of any competitive water brand and 60% that of leading sport drinks. ELECTROLYTES MATTER. We put our water through a rigorous ionization process that changes the DNA of the water, increasing the pH to a 9+ level, guaranteeing product quality for a 2 year shelf life. The elevated alkaline levels help to bring the body back to balance. Many of the processed foods and beverages we eat are acidic in nature. While acid consumption is unavoidable, the human body must always regulate to a neutral pH of around 7.4. The body’s process of regulation, known as homeostasis, can consume significant amounts of energy if one’s diet is too heavily acidic. Alkalinity is a measurement of the ability to absorb acid. The more alkaline a liquid, the less acidic it will be. Alkalinity is measured by a number called “pH.” The pH scale ranges from 0-14, with 0 being the most acidic and 14 being the most alkaline. Most bottled water is pH neutral at 7. For every change in the pH number, its alkalinity changes ten fold. For example, a leading sports drink that has a pH of 4 is 100,000 times more acidic than AQUAhydrate, which has a pH of 9. AQUAhydrate’s alkalinity provides beneficial support of this process, helping balance out acidic foods without needing the body to expend energy to reach neutral. AQUAhydrate helps bring your body back to balance.